The new Kettler multi-position handlebar offers you to adjust a multitude of further grip possibilities on your exercise bike. 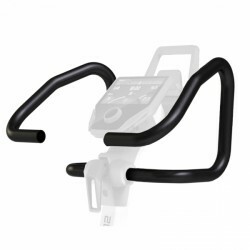 Thanks to the new quick lock on the steering column, you can quickly replace the multi handlebar against the standard handlebar in a few steps. The additional grip options relieve the shoulder and back muscles and increase the training comfort. The handlebar is also especially suitable for smaller persons, because the space between saddle and handlebar is shortened.